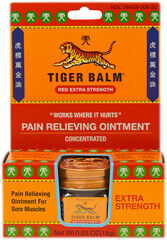 Spinal Trap: Back 2 Good - Tiger Balm The first product of Tiger Balm that I ever tried was "Red Extra Strength" Ointment. When it dries, it has a yummy spicy cinnamon smell that is very enjoyable. Unfortunately though, the red color will transfer and permanently stain your clothes so put on a ratty old t-shirt or sweats that you don't care about before you apply. Speaking of which, it is SUPER potent so you need to throw on a pair of disposable gloves because if you don't and you don't wash it off completely and then you rub your eye, you will live to regret that...(Use gloves with ANY version!) ﻿ This product does help but when I am in a moderate to severe pain flare up, in and of itself, it is not enough to decrease my pain. I still have to utilize other methods of pain management. The next version I tried is their "Ultra Strength" ointment which is a clearish white color. The good news is that it does not stain your clothes, the bad news is I do not find it as effective as the Red Extra Strength. Thus, I would advise this version only for use on low pain levels. 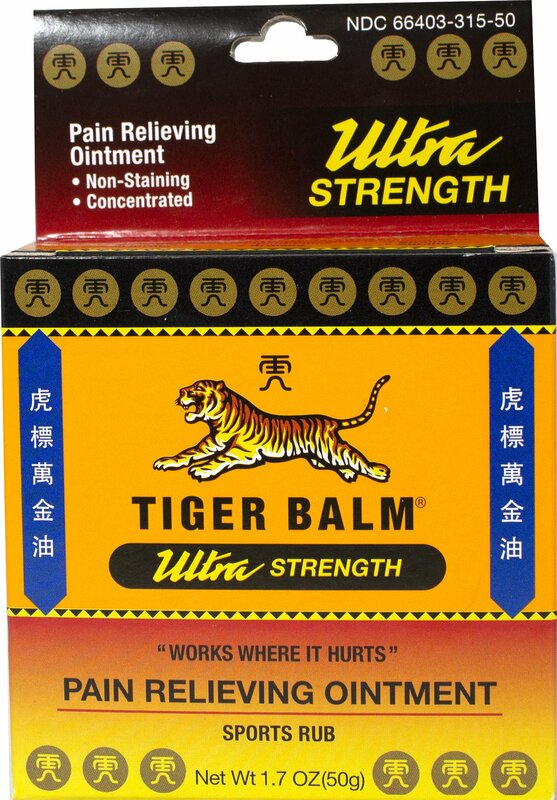 ﻿ The next Tiger Balm type I found recently is their "Neck & Shoulder Rub". It's a white cream and does not stain clothes and the better news? It works great even on moderate to severe pain! My neck is the most damaged area of my spine so for ANYTHING to help it, it has to be great! ﻿ "Muscle Rub" cream review coming soon!﻿They do make other products which I have not yet tried, please check back regularly for review updates! Unfortunately though, the red color will transfer and permanently stain your clothes so put on a ratty old t-shirt or sweats that you don't care about before you apply. This product does help but when I am in a moderate to severe pain flare up, in and of itself, it is not enough to decrease my pain. I still have to utilize other methods of pain management. The next version I tried is their "Ultra Strength"
ointment which is a clearish white color. Thus, I would advise this version only for use on low pain levels. It works great even on moderate to severe pain! for ANYTHING to help it, it has to be great! "Muscle Rub" cream review coming soon! please check back regularly for review updates!